You are here: Home / Financial Planning / Is Lack of Adequate Income When You Retire A Concern For You As Well? And seems like there is a good number of people who are concerned about having enough to spend or to last through their Retirement, followed by the concern to provide enough for their Family Members. So is this a concern for you as well? And if it is… how do you go about planning for it? But First… When Does Retirement Planning Really Start? In general, Retirement Planning should start as early as possible especially when you know how to make your first dollar (outside of your parents’ financial support) and you are disciplined enough to set aside (without utilizing) a sum of money (can be as little as $10 a month when you are a teenager or 10 – 20% of your income when you start working). The reason for starting early and being disciplined will allow your investment tool and time to work its “compounding” magic or what we usually termed as “money working harder for you”. In general, a Retirement Number is the Lump Sum of Money that you must have the moment you retire. For example, you want a $2,000 per month lifestyle that will last you for 20 years, therefore you would need to have at least $480,000 and this is before taking into account any Inflation Rate. If you do take that into calculation, the amount is definitely larger than $480,000. Therefore you always need to have this Retirement Number in mind so that you can work towards it and adjust your current lifestyle to meet this goal. And do take note that this Retirement Number should be reviewed on a regular basis (either on your own or with a Financial Planner) and be adjusted accordingly. You would need to know which of these (or which combinations) would work well on you based on the comfortable risk level that you wish to take on in the long run. Therefore it’s advisable to educate yourself well on them. Once you know your Retirement Number, know your Risk Appetite and know the Investment Tools that you want to tap on… you must really put them into action (even when there’s other temptations or other channels that you think its worth putting your Retirement Money into)! Doing a regular review on your Action Plan will help you to ensure that you are on the right track – planning well and having enough income for your Retirement. And should you be off track, these reviews should alert you to seek alternatives or to seek professional advise on what’s best for you – you need time (and a lot of it) to help you plan well for your Retirement. Do also note that even if you are on track (or doing much better than as expected), you should not adjust too much of your plans (e.g. lower your monthly contributions) especially when you are comfortable with what you are doing. In this case, you should adjust (lower) when you are finding it hard to pay off your bills, pay for your necessities or when you have to survive on bread & water just to ensure that you have a comfortable retirement. 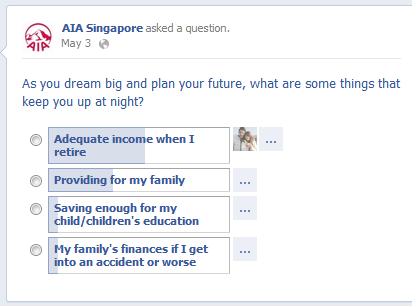 I do hope these Four Pointers can help you to minimize your concern of having inadequate income when you retire!